Since 2008, the superhero genre has been proving its longevity and its flexibility and as of right now, we are living in a golden age of superhero movies. Yes, every once in awhile, we still get a bad or a mediocre superhero movie. But in the early 2000's, it seemed like we had to really work hard to find just a good superhero movie. Nowadays, they seem commonplace, it seems like everybody in show business is starting to figure this genre out, and the results have been mostly exciting. With so many options, its tough to really distinguish what the best of the bunch is. I know what my favorite superhero films are, but my list could possibly look totally different compared to many other people. There is no real way I could bag them for their lists, the output these days is that good. I believe I can say with utter confidence that Captain America has the best superhero trilogy so far. The Captain America movies are the only superhero movies so far to be across-the-board awesome. Not much falter in any chapter of the Captain America saga. If you look at X3, it doesn't compare to X1 or X2. If you look at "Spiderman 3," it doesn't compare to "Spiderman" or "Spiderman 2." Even Christopher Nolan's Batman saga isn't an all around hit. I am one of the very few who really enjoyed "The Dark Knight Rises," but its not on the same pedestal as "Batman Begins" and especially "The Dark Knight." I love me some "Iron Man," but "Iron Man 2" is mostly a commercial for what's coming next, and I think "Iron Man 3" barely registers as an Iron Man movie. So far, its been the Captain America movies that pushed Cap further as a character, setting up a unique and challenging obstacle for him each movie. This is not a series of films that merely tread water just to make money. This is a fine example of character growth, and each film in Captain America's saga is much different from the last. "Captain America: The First Avenger" was a swashbuckling adventure, I loved the "Indiana Jones" and "The Rocketeer" vibe that movie gives off. "Captain America: The Winter Soldier" is very much a 1970's style political thriller, a massive mystery that kept you guessing. Now, with "Captain America: Civil War," Cap and the rest of the Avengers have to answer for the MCU's (Marvel Cinematic Universe) collateral damage. Something that has always disappointed me over the course of this franchise is that there are very few stakes for these characters. There is also never much study of how the regular world has reacted to superpowered individuals suddenly appearing in it. Its really far-fetched to believe the world would just go on unaffected if superpowered people just suddenly appeared. Finally, the MCU is no longer very happy-go-lucky. Finally there are some genuine stakes for these characters we have come to know for almost a decade. Finally, our heroes have to face the consequences of collateral damage. Once again, directors Anthony and Joe Russo have shattered the status quo of the MCU, and this time there is no way there can be that easy of a reset button. We find Captain America (Chris Evans) leading a new team of Avengers to stop a group trying to steal a biological weapon. This group is lead by Brock Rumlow (Frank Grillo), the guy who turned out to be HYDRA in "Captain America: Winter Solider." While Black Widow (Scarlett Johansson), Falcon (Anthony Mackie) and Scarlet Witch (Elizabeth Olsen) neutralize the threat, the mission ends in tragedy. 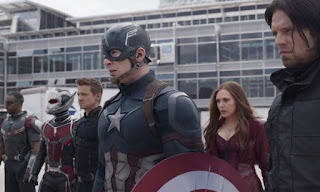 Back at Avengers base, Captain America's team is visited by Thaddeus Ross (William Hurt, reprising his role from "The Incredible Hulk") and Tony Stark (Robert Downey Jr.) about signing The Sokovia Accords. The accords are a new series of laws which will allow a United Nations governing body to decide when The Avengers need to be called to stop a threat. Stark is all for the law, as he faces another reminder of why Ultron was such a bad idea. Stark isn't the same man we were introduced to in his first movie. He can't help feeling so much guilt and remorse over not saving enough lives, over not doing enough for the greater good, that it truly haunts him. Cap on the other hand, can't see himself working under any sort of government leadership. Not when a terrorist organization infiltrated S.H.I.E.L.D. and planted seeds in S.H.I.E.L.D. for close to 70 years. The safest hands Cap sees are his own, he doesn't want to run the risk of becoming corrupt or working for the interests of a few. To add more drama, Cap's brainwashed friend Bucky (Sebastian Stan) has resurfaced and he is framed for a bombing in Vienna. Cap is trying to find Bucky and prove his innocence, especially when the duo finds out that someone else was behind the bombing, and that this certain someone has far more sinister plans for the world. Can Cap show his best friend's innocence? Will the Accords stop him from acting upon helping his friend? Avengers, new and old, begin choosing sides. Stark leads the charge on pro-government regulation, while Cap creates an opposing force. While the movie jam-packs supporting characters, superheroes we love, and even some new characters, it never refrains from telling the story of Cap's new struggle. It shows us how he continues to adjust to our modern world and how that begins to drive a wedge between his new-found friends. Taken as a stand-alone movie, "Captain America: Civil War" is easily the most confident movie Marvel has made so far. The Russos have proven that they can shoot comic book action on a ridiculously dazzling scale. There are moments in this movie I never figured I'd ever see brought to life, and I love that the Russos make it all effortless and entertaining. I also love that they've created a compelling story with real stakes for the characters. I love that the big airport brawl is thrilling, whimsical and even a bit comedic. Then the final fight that closes the movie out isn't thrilling or funny at all. Its highly emotional, its tragic and it had me on the verge of tears. Unlike "Batman vs. Superman" where the two opposing forces fought because the movie required them to, "Civil War" is a fight of complete understanding of both sides. The movie does a good job of making sure you cheer equally for each side. Yes, it helps that we have come to know these characters for almost a decade, but everything is fully explored, fully explained and fully realized (something "Batman vs. Superman" could have done, but didn't). We feel every blow put on Cap and Stark, and those blows feel devastating. People always complain when a big ensemble piece like this comes out in the superhero genre. I love that there are so many characters in this movie, who each get a moment to shine. BUT, it never once stops being a Captain America movie. There are several laugh-out-loud moments with Ant-Man (Paul Rudd), Vision (Paul Bettany) and Scarlet Witch share some oddly touching scenes together. The relationship between Bucky and Falcon is funny. Sharon Carter (Emily Vancamp) emerges as a well-rounded character here, and I'll be curious to see where her character goes from here. Thaddeus Ross is wonderfully annoying. I even like the few moments Martin Freeman has as Everett Ross, a government worker who plans to put Bucky through therapy. There are so many rich character moments in this movie, and they are all major highlights. Then there are the two big new characters. I say big because you are going to go wild when you meet T'Challa AKA Black Panther played by Chadwick Boseman. You will go even crazier when you meet Tom Holland's Spiderman. Black Panther goes through an enormous emotional journey, and by the end of the film, he's just as realized as Cap or Stark. He feels like he's been apart of this franchise as any veteran, fitting in with ease. From his fighting scenes to Boseman's incredible Wakadan accent, he's an authentically real character, even though he hails from a fictional nation. Then there is Spiderman. Now, I don't drop the "P" word too often around here. But I have to say with confidence that Holland's Spiderman and Peter Parker is PERFECT. You know how in the comics, Spiderman would outlandishly taunt his foes to throw them off? That's full force here. His movements are as amazing as ever. But, Spiderman and Peter Parker's true colors come out in a fantastic scene when Stark and Parker meet for the first time and discuss why Parker became Spiderman. Its incredible acting work on both fronts, and Holland cements himself in the role. Then there is the true villain of the film. Daniel Bruhl plays Baron Zemo. Zemo was a HYDRA agent in the comics, who fought with a sword and wore a wacky purple mask. The Zemo in this movie is nothing like his comic book counterpart. Many people have bashed the villains of the MCU, arguing that other than Loki, none of the Marvel villains are as interesting as their heroes. Zemo is fascinating villain, with an "evil plot" that comes from something very personal and deep. He doesn't want to subjugate the human race like Loki did, he doesn't want to purify Earth of good like HYDRA did, he doesn't want to decimate the world like Ultron did. Every decision Zemo makes in this film is due to his own anger, and his need for revenge. He's a truly engaging villain, and hopefully we see more of him later in the franchise. I feel after all of this explanation, I have barely scratched the surface of this movie. So you can bet big time that I will be running a Further Inspection piece on this movie. After you've all had a chance to see this movie, I want to go back and really dig into the spoilers. Really crash into the psyche's and decisions of these characters. For right now, just know that "Captain America: Civil War" is a new gold standard for this wonderful franchise. Its the Avengers movie we deserved last year, giving our heroes some compelling and thought-provoking terrain to charge through. The events of this movie will once again affect the upcoming movies, and it will be interesting to see where these characters are by the time Thanos comes calling in 2018. The Russo brothers have proved how ambitious and talented they are as directors. Its also a promise that the two-part "Avengers: Infinity War" will not be noisy chaos. The Russos have given our heroes some real weight and depth here, and that should pay-off in spades within the upcoming years.